We attend lots of uninspired children's birthday parties. I don't mean to offend, but most of them are boring. Part of the problem is that it is hard to get creative when the guests are toddlers with short attention spans, limited vocabulary and nap times. Believe me, I get it. But sometimes I feel parents don't even try. All a bunch of 1-3 year olds need is to be entertained for an hour. How hard is that? The birthday party we went to last Saturday proved my point. It was smart, fun, and affordable! The theme was racing and the parents of the birthday boy had the genius idea to rent a tennis court at their neighborhood public park (free!) and invite 15 toddlers to bring their ride-on toys, and tricycles, balance bikes. We let them loose on the court, which was decorated with cones and racing flags. The kids were in heaven. The parents stood on the sides and watched while having adult conversations. The party started at 10 am before naps and the Texas sun got unbearable. It lasted 1.5 hours, enough time for play, snacks, and cake. It was short and sweet! What a great idea! I have to say that I only had a 1st birthday party for my oldest. #2-#5 didn't/won't get parties until they're old enough to give input. I really do like that idea. The problem with jasmines parties for me is the fact that I don't have to entertain toddlers really, most of her cousins are older and I have to make sure they aren't too bored. So that's my issue as of now. I'm hoping to figure something out within the month. What a great idea!!! (and a cuuuute girl!!!) We are having a first birthday party for Addie but it will just be family and no kids really. If I were inviting little ones though I'd have to think about this idea!!! Definitely a great idea! We went to one party at a bouncy place and they also had cars all over the lobby. 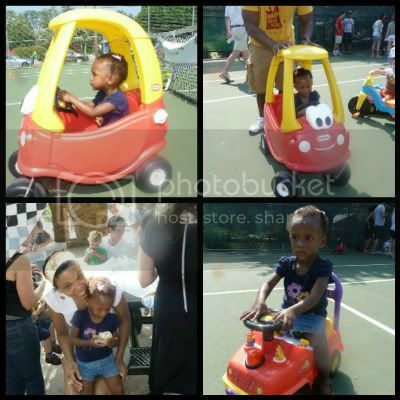 The cars were a big hit with the kids. I am going to cop out this year and go the hosted party route. I'm thinking one of those Little Gym type places.